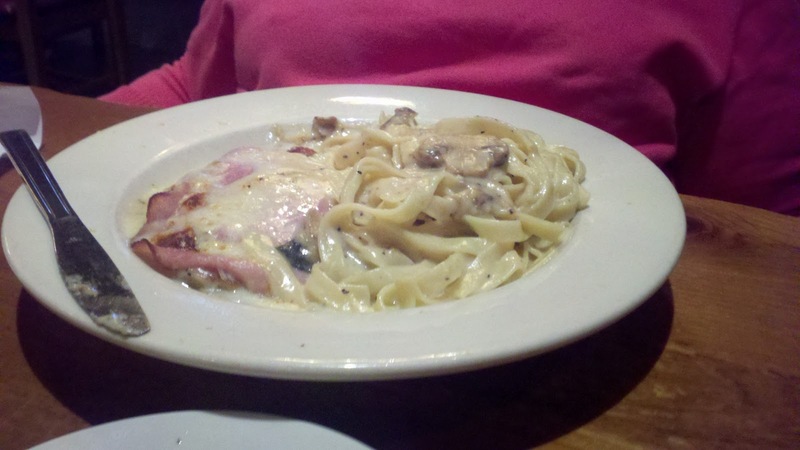 Yesterday my mom took Matt and I out for Sunday dinner... She wanted Italian and she has never been to Johnny Carino's, so off we went. I went there with work for lunch a long time ago and it was pretty good.. This time was a little disappointing. When we arrived we had to wait for a hostess to come and greet us, the stand was empty and they were not busy. The hostess seats us and the waitress comes over and asks what we would like to drink and takes our order. We look over the menu while waiting for our drinks. I'm not getting a good vibe from our waitress, she was not too pleasant as she took our order. She comes back with our appetizer, Fried Mozzarella with Mariana which was pretty good. Then all of a sudden she brought out or salads and soup. Timing was a little bit off. We finish our appetizer plus our salads and soup. Matt and I had garden salads, I had the house dressing, which was good, and Matt had Gorgonzola dressing on his. I can't remember what kind of soup my mom had but she said it was good. 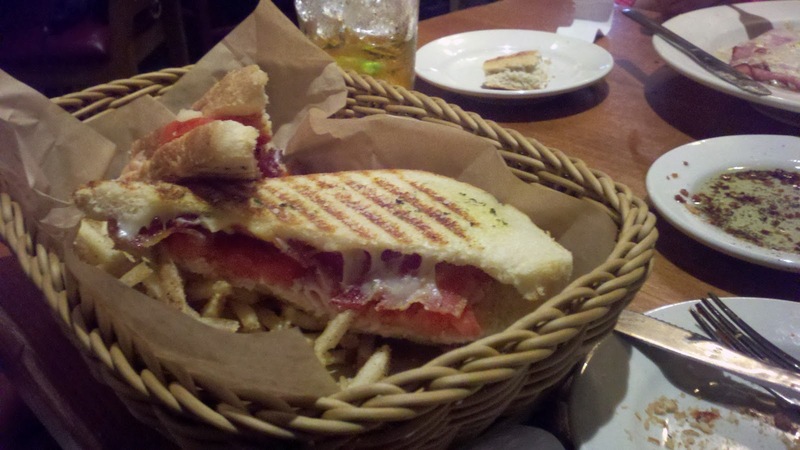 Matt ordered Smoked Turkey and Bacon Panini, Smoked turkey, applewood smoked bacon, gorgonzola, mozzarella and roma tomatoes. We decided to get dessert, we were going to split it but they had mini desserts, which we ended up getting. Matt stepped away from the table for his after dinner dessert outside..but wanted an espresso. 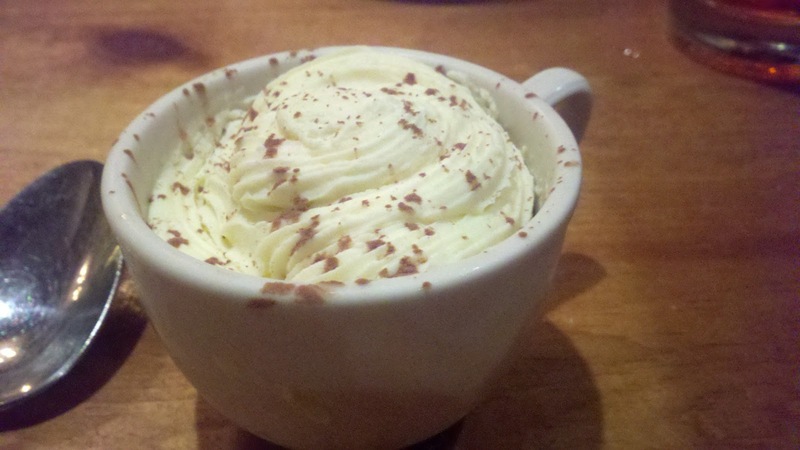 So, my mom and I order mini Tiramisu that come in espresso cups and we order Matt's espresso... Waitress: Oh, we don't have espresso... Us: It's on your dessert menu... Waitress: Well, that is an old menu and we need to update it. I don't know why they have not updated the menus.... Well you should of told us when you gave us the menu, is what I was thinking... so Matt ended up getting a coffee. 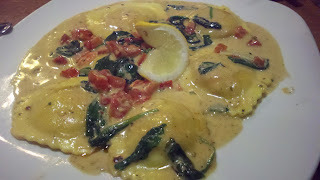 The food was good... not the best that we've had, but good. I do think they put MSG in their food... After I eat food with MSG I get spaced out feeling and I was feeling spacey for a little bit that night after eating. The rest of the garden is doing good... The other 2 tomato plants are doing good, Had about 6 tomatoes from the smaller plants... Tons of basil and oregano, also pictured is my strawberry plant to the far left and the patio tomato plant to the right. You can't see the chives as they are hiding behind the basil. Here is my better boy tomato plant, which got a little bit of a late start, parsley, green onions that I started from a bunch I bought at the grocery store and my Gerbera daisy. Right now I have a second crop of Strawberries growing. This year I've gotten about 5 tiny berries, plus the 2 pictured below. 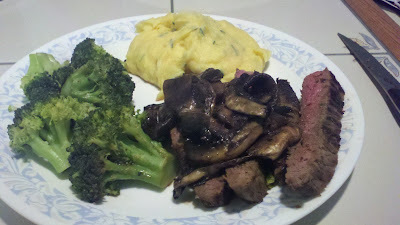 Anyways, tonight we had terikaki steak with sauteed mushrooms, steamed broccoli and cheddar and chive mash potatoes. I marinated the steak for 24 hours and sauteed the mushrooms in terikaki sauce. I as pretty proud that I didn't cook the steak to death... I'm getting better at leaving a little pink in the middle. So, you probably wondering what the hell the title of this entry means.... 今日は, お元気ですか??? Hmmm how about Konnichiwa, o genki desu ka? Of course we started off with a beer... I can't remember the name of what Matt had, neither can he, besides it was named after a girl... I had the Pineapple Under The Sea ;) Which we both enjoyed but my pineapple was a little cloudy compared to when I first had it a few months prior. Rivertown Pour House only serves beer that they brew in house. 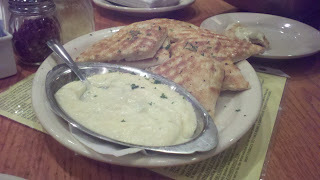 We also ordered the Pourhouse beer cheese dip... It was pretty damn good... With the beer and the cheese dip I hardly had any room left for my entree and the same went for Matt! 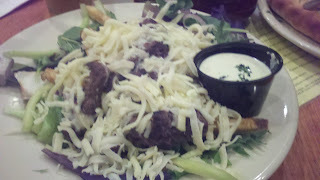 I ordered the Yinzer salad with steak and Gorgonzola dressing... If your from the 'burgh, I don't have to explain... but for those of you who are not, it's a salad with french fries on it... Healthy, i know... haha... They did go a little overboard on the cheese, but it was pretty good. I ended up taking most of it to go. 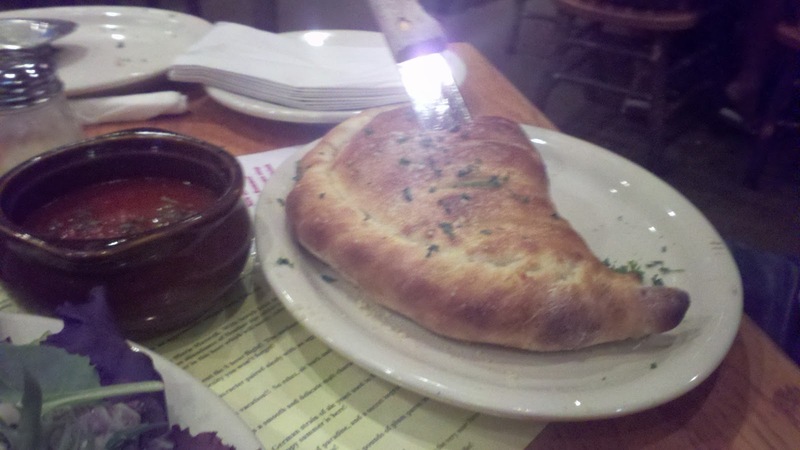 Matt ordered a Stromboli, which was delivered with a nice big steak knife in the middle... He can't remember what was in it, but it was good.... He ended up taking half of it home too. Overall this place get's an A in my book. It's a great place to grab a bite to eat and spend some time with friends and family. 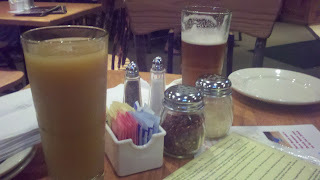 Plus they have a great beer selection! Over the weekend we had our friends over to play Magic... It's been a while so, Matt and I made Buffalo Chicken Dip and we had everyone else bring something. We had some left over dip and Matt wanted pizza for dinner tonight... so instead of BBQ chicken pizza... we had BBQ Buffalo Chicken Pizza. I was surprised how good it was. 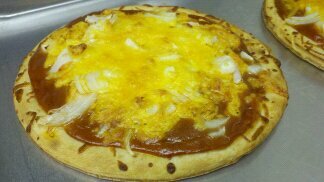 I threw together Bull-eye Carolina BBQ sauce, a little bit of buffalo chicken dip, diced onions and cheddar cheese on a premade crust. Bake it for 10 min and voila! Also on Saturday I was looking outside at my plants on the balcony and I thought I saw a humming bird in one of my hanging baskets... I get up off the couch to get a closer look and it was a HUGE butterfly... It kept flapping it's wings really fast, which is why I thought it was a humming bird. I ended up getting a few pics but they didn't come out great on my phone. I've never seen a butterfly so big... A few weeks ago Matt was on the balcony at night and was joking the moth man was out there. We think it may have been a butterfly like this one. 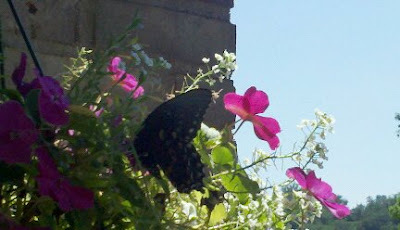 You really can't see the color and pattern on it's wings but it was black with orange and blue circles.